I have mirrored on my various computers a huge directory called ‘toread’, in which get stuffed willy-nilly the various PDFs of academic writing that I come across while out and about the net, and every now and then I make a short-lived assault on it. At the time of writing this had just brought me into contact with an unusual article from Speculum of 2007, in which notable medievalists Michael McCormick and Paul Edward Dutton team up with a climate scientist by the name of Paul Mayewski and ask, more or less, can we achieve anything like precision in assessing how the weather and changes in it affected the societies of the early Middle Ages?1 And this is a thing I care about, sort of, so it probably won’t surprise you to learn that I read this with a sharp eye and have an opinion about it. 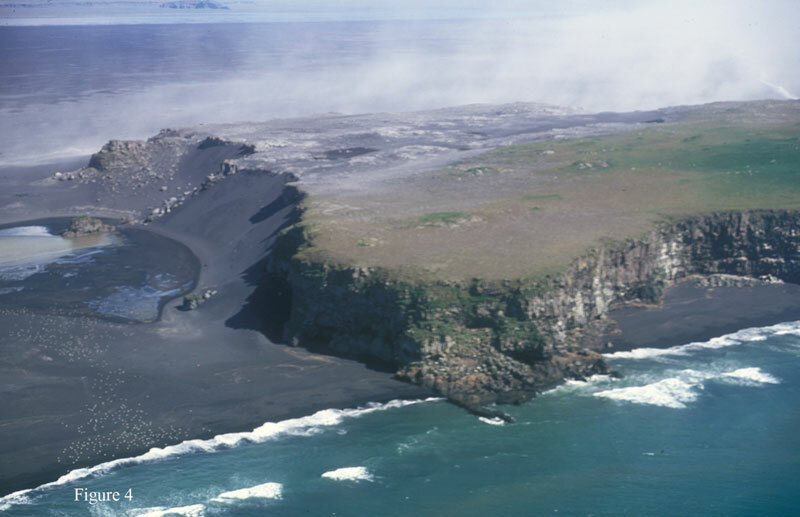 The Icelandic volcano [Edit: system] of Eldgjá, blamed here for an eruption c. 939 on the basis of tephra analysis. “Eldgja” by Andreas Tille – Own work. Licensed under CC BY-SA 3.0 via Wikimedia Commons. Firstly it needs to be stressed that this is not an article about climate change, per se, though there is a certain amount of that in it as background. Cautious work I’ve seen on climate change has stressed that while it deals in overall trends of up or down a degree or two, the actual experience of this would have been far less comprehensible because of a huge range of local and chronological variation. If, for example, the winter temperatures where you are range from -18° Celsius to 13° Celsius over ten years, when a century earlier it had been -13 to 18, then yes, the median drop is already pretty severe but perceiving the actual pattern in any of those ten-year slots is going to have been pretty difficult given that maybe one January all the rivers froze and then maybe four years later your vines grew a second harvest because it was so sunny.2 And this article is interested in that short-range variation, the experience of individual years. The way they take this on is relatively simple, though it must have required a lot of work: McCormick and Dutton, both of whom have pedigree in this kind of question, separately compiled lists from documents of especially extreme winters in the years 750-1000, while Mayewski pulled a huge dataset from a Greenland ice core extracted in the 1980s and went through it looking for spikes in the deposition of chemicals associated with volcanic eruptions, whose aerosol effects in blocking out sunlight and lowering temparatures the authors work hard to show are widely accepted in meteorology.3 Then they compared their findings, chucked out anything that wasn’t certain and still had nine episodes where the dates for bad winters in the documents married up closely with dates for volcanic deposits. As well they might! And of course, all this matters a very great deal in a society where the principal source of wealth and indeed subsistence is agriculture. Firewood can’t be gathered, new crops can’t be planted or are blighted by the temperature, animals die, wine freezes in barrels and is ruined, famine is grimly sure to follow.5 There certainly should have been big consequences of this kind of climatic variation. Manuscript illumination of Emperor Louis the Pious as a Roman-style ‘miles christi’, by Hraban Maur, not visibly taking any responsibility for the climate. “Ludwik I Pobożny“. Licensed under Public domain via Wikimedia Commons. If I’d submitted that to a journal like this I’d almost have expected it to come back stamped with “CORRELATION DOES NOT EQUAL CAUSATION” and indeed, if this had gone to a science journal I feel sure this would have been redacted. “Perhaps not entirely coincidentally”? Come on… This doesn’t diminish the factuality of their observations, but it certainly does need to be carefully considered just what this data explains. The paragraph quoted also exposes another problem with the method adopted. In terms of volcanic aerosols, yes, Charlemagne may have been lucky, but the ruler who lived through the famines of 792-793 and 806 might have been surprised to be told so.8 If volcanoes caused bad weather, they certainly didn’t cause all of it, nor even perhaps the worst of it. This is something the authors of this article willingly admit, not least because their proxy for volcanic activity is located to the west of the most likely volcanoes, in Iceland, and the area they’re studying is to the east, though the Gulf Stream makes that much less of an objection than it sounds.9 Nonetheless, when the recent ash-cloud closed the Atlantic to air travel, I personally didn’t notice any shortfall in local autumn apples in the UK, did you? And so on. When one looks more closely at the chronology, in fact, this gets rather odder. There are acknowledged problems with the chronology here; the texts, though subjective, are at least reasonably chronologically precise, and it’s useful to see it all together, because it means that even when things with chronology as shaky as the Irish Annals are being deployed, they’re being correlated with unconnected texts that give one some confidence in the dates. Not so the ice-core, unfortunately; that was sampled every two and a half years and the possible error of each sample is somewhere between one and six years.10 When one notices, then, that the volcanic deposition evidence that correlates with the 763-4 ‘event’ came from the slice for 767, obviously that possible error is important; either the sample’s dating must be emended, or the bad weather was well in force before the volcano did its stuff. The authors seem too comfortable about this for my liking and I agree with them very much that it would be nice to get a new core with the more precise dating that is now possible.11 That would also refine cases like bad winters in 855-856 and 859-860 which correlate with deposition spikes in 854, 856 and 858. It does fit quite nicely but whether or not, as the authors prefer, this was one long volcanic event, the fact that it apparently got better in the middle again monkeys with any simple causation from volcanic eruption to economic and climatic distress. I do think this article shows that something was going on here that deserves to be considered, and I am myself still very much of the persuasion that such factors do need to be considered as explanations for social change, but despite the extra precision attempted here I still don’t think we have anything as simple as A causes B causes C here, and I don’t honestly see how we get it, however much the technology may improve. 1. Michael McCormick, Paul Edward Dutton & Paul A. Mayewski, “Volcanoes and the Climate Forcing of Carolingian Europe, A.D. 750–950” in Speculum Vol. 84 (Cambridge MA 2007), pp. 865-895. 2. There’s lots of examples of freezing rivers (and occasionally seas!) in the article; the second harvest of grapes is something that repeatedly comes up in Gregory of Tours’s Histories, though it’s never good: see Gregory of Tours, The History of the Franks, transl. Lewis Thorpe (Harmondsworth 1974, many reprints), VII.11 or IX.5. 3. McCormick’s and Dutton’s work on such matters is in fact encapsulated in the same volume, in the forms of M. McCormick, “Molecular Middle ages: early medieval economic history in the twenty-first century” and Paul Edward Dutton, “Observations on Early Medieval Weather in General, Bloody Rain in Particular”, both in Jennifer R. Davis & McCormick (edd. ), The Long Morning of Medieval Europe: new directions in early medieval studies (Aldershot 2008), pp. 83-97 & 167-180 respectively. On the methodology, see McCormick, Dutton & Mayewski, “Volcanoes”, pp. 867-878 and esp. 876-878. 4. Ibid. pp. 880-881, citing “The Chronicle of Theophanes Confessor: Byzantine and Near Eastern History, A.D. 284–813, trans. Cyril A. Mango, Roger Scott, and Geoffrey Greatrex (Oxford, 1997), pp. 600–601″ and “Nikephoros, Patriarch of Constantinople, Short History 74, ed. and trans. Cyril Mango, Corpus Fontium Historiae Byzantinae 13 (Washington, D.C., 1990), pp. 144–49, here pp. 144, lines 1–16, and 147″, along with full edition refs for Theophanes and some discussion of the connection between the sources. 5. McCormick, Dutton & Mayewski, “Volcanoes”, and their refs at e. g. pp. 879 (blight), 882 (impossibility of planting), 883 (death of beasts), 885 (more blight and death of beasts, also freezing wine). 6. Ibid. p. 867 (“that surely explains the suspension of the major effort by the king to conquer Aquitaine the following summer”) cf. p. 892, quoted below; on debate over Louis the Pious see Heinrich Fichtenau, Das karolingische Imperium. Soziale und geistige Problematik eines Grossreiches (Zürich 1949), transl. Peter Munz as The Carolingian Empire (New York City 1954), Louis Halphen, Charlemagne et l’Empire Carolingien (Paris 1968), transl. as Charlemagne and the Carolingian Empire (Amsterdam 1977) or François-Louis Ganshof, “Louis the Pious reconsidered” in his The Carolingian Empire and the Frankish Monarchy (London 1971), pp. 261-272, versus the various studies in Peter Godman & Roger Collins (edd. ), Charlemagne’s Heir: new perspectives on Louis the Pious (London 1990), especially Stuart Airlie’s and Janet Nelson’s. 7. McCormick, Dutton & Mayewski, “Volcanoes”, p. 892. 8. Adriaan Verhulst, The Carolingian Economy (Cambridge 2002), pp. 123-124. 11. Expressed ibid. p. 891. I discovered after first drafting this a newer paper by one of the same authors and a bunch of others, Francis Ludlow, Alexander R. Stine, Paul Leahy, Enda Murphy, Paul A. Mayewski, David Taylor, James Killen, Michael G. L. Baillie, Mark Hennessy and Gerard Kiely, “Medieval Irish chronicles reveal persistent volcanic forcing of severe winter cold events, 431–1649 CE”, in Environment Research Letters Vol. 8 (Bristol 2013), pp. 24-35, doi:10.1088/1748-9326/8/2/024035, which takes the same essential data over a longer range, using however only the Irish Annals, excluding ‘unreliable’ events but not engaging at all with the difficulties of their year-by-year chronologies, and winds up essentially using those to add precision to dating of events from the same Greenland ice-core sample. I haven’t read this in detail, nor have I read much of the recent work by McCarthy on the Annals that they cite, but their approach to the texts makes me wince pre-emptively even so. Anyway, the article is Open access and can be found here, and it is picked up by the BBC here, bless them linking to the actual article unlike some, whence it was reported by via David Beard’s Archaeology in Europe where I read it, and to whom therefore a tip of the hat! Tagged climate change, famine, medieval agriculture, Michael McCormick, Paul Dutton, Paul Mayewski, science! it is unfortunately rare for the authors of that research to have read enough in the field to which they’re supposedly contributing to have an accurate sense of whether or not they really are. Because sometimes you only have a sentence worth of content and it seems foolish to make them all their own posts. 1. J. Dodds, “Entre Roma y el Romànico: el mito de Occidente” in Jordi Camps (ed. ), Cataluña en la época carolingia: Arte y cultura antes del románico (siglos IX y X) (Barcelona 1999), pp. 147-155, transl. as “Between Rome and Romanesque: the myth of the west” ibid., pp. 492-496. 2. J. Phillips, Defenders of the Holy Land: relations between the Latin East and the West, 1119-1187 (Oxford 1996). 3. A. Bayliss, E. Shepherd Popescu, N. Beavan-Athfield, C. Bronk Ramsey, G. T. Cooke, A. Locker, “The potential significance of dietary offsets for the interpretation of radiocarbon dates: an archaeologically significant example from medieval Norwich” in Journal of Archaeological Science Vol. 31 (Amsterdam 2004), pp. 563–575. Tagged burial archaeology, chronology, ideology, Jerusalem, medieval architecture, science! Still short on time to generate actual content here, I hope you’ll forgive a second post in a row instead directing you to look at something else; it is good, I assure you. You are, I hope, aware of a column in the UK’s Guardian newspaper by Dr Ben Goldacre called Bad Science, in which he more or less single-handedly tries to take on misunderstanding and misrepresentation of the natural sciences, especially medicine, drugs and clinical trialing, in the media and advertising. (Aha! He is also posting it as a blog. So blogrolled.) It’s a valuable and under-rewarded service, because really I would like there to be a publicly-funded blog or website doing this, a kind of scientific Snopes.com debunking that which needs debunking,* to which people could go and get the, er, straight dope. * Hey, Latin? Can I borrow some gerundives of obligation? Yours are so much nicer than ours. **** Look, seriously, by now you could have found out the truth for yourself, and Dr Pyrdum wants his footnote style back so I can’t tell you any more. Tagged bad history, Ben Goldacre, Matthew Reisz, science!